Whether your business is large or small, a network risk assessment is one of the best things you can do for your employees to ensure control over your networks and data, as well as reducing the risk of cyber attacks, which can bring your business to its knees. A network risk assessment is an assessment of the network(s) your business and employees use each day. The assessment helps identify what the risks are to your critical systems and sensitive data, by using risk assessment tools. Once these risks are known and identified, you can begin to organize your data by the weight of the risk associated with it. Did we lose you yet? When it comes to information technology and your business, we know it’s not always the easiest to understand when applying to your business strategies. However, don’t feel like you have to do all this on your own! A knowledgable and experienced managed IT services provider specializes in network risk management and assessments. It’s their job to help you through every step of the way, especially when it comes to performing the assessment itself. Never heard of managed IT services? Read our article to learn how these services go hand-in-hand with network risk assessments, What is Managed IT Services? How to Tell If You Need Them. A network risk assessment is a great step to take to support the efforts of your growing business by helping you accomplish the goals you’ve set in place. 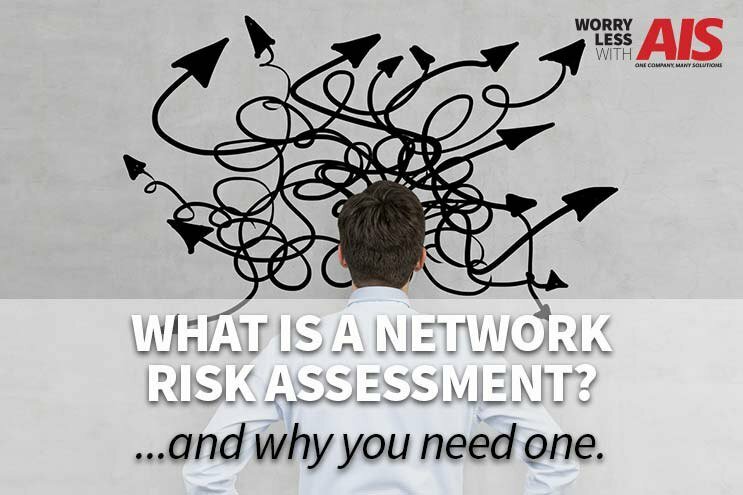 Follow along as we explain all the moving parts of a network risk assessment. When a network risk assessment is performed, all of the devices on your network are examined and analyzed. A network risk assessment looks at how each of these devices (such as computers, laptops, iPads, servers, routers, etc.) are managed. Some of these devices have compliance modules that the assessment picks up, such as PCI and HIPAA compliance. When a managed IT services team runs the network assessment, they also study the exchange server. The scans over the exchange server test for anomalies or issues specific to compliance. A network risk assessment has the power to identify atypical data or anything that may stand out—outside of compliance. To learn more about the approach of a network risk assessment, read an article Tech Republic published, Take this four-phase approach to a network risk assessment. It’s also important to know that some qualified managed IT services providers charge a minimal cost for network risk assessments. Another consideration when it comes to tools is the pricing and costs associated. These assessments and tools can become a costly expense for your business. Before we wrap up, we’re sharing some common network risk assessment results we’ve seen that stress the importance of the assessment. These are great references to use while you review your own network risk assessment. Issue: Computers were found using an operating system that is no longer supported. Unsupported operating systems no longer receive vital security patches and present an inherent risk. Issue: Anti-virus software was not detected on some computers. Without adequate anti-virus and anti-spyware protection on all workstations and servers, the risk of acquiring malicious software is significant.